This week down Brit Grit Alley, I have a guest column from Keith Nixon whose acclaimed debut crime novel The Fix has recently been published by Caffeine Nights. Here Keith talks about some of his favourite Brit Grit crime writers. 'I’ll open with making an obvious statement – I was a reader long before I became a writer… but show me someone who wasn’t? I read a lot and I prefer the books I pick up to be tight, punchy and of the crime / thriller variety. Just after self-publishing my book The Fix (which is, erm… tight, punchy and of the crime variety) I was looking for a method of gaining experience and exposure in the literary world. I stumbled across a book review site – Al’s Books & Pals and he kindly let me loose on his reading pile. Al focuses entirely on self and indie published books of every genre and this really struck a chord with me. In my day job (another common affliction of writers, we don’t earn a lot) I spend my time being involved with changing industry norms – and this is exactly what’s happening in publishing, as I’m sure you know. The self-publishing phenomenon means anyone can put out their work. But the old adage of ‘everyone had a book inside them’ to me needs qualification. It’s probably true. However not all of these stories will be compelling and of those that are, not everyone will be capable of communicating them in an effective manner that engages the reader. So a key part of a reviewer’s job is to trawl through the good, the bad and the downright ugly to unearth the gems. And then tell people about them. And this has been entirely the case in the indie books I’ve read over the last year. I’ve suffered some absolute howlers, but discovered some great new (to me) authors – and the good news is, I’ve barely scraped the surface. Many of these authors, more than likely, would never have made it into traditional print if it were not for this sea change in the publishing industry. After writing my own book, being a reviewer is by far the next best thing I do. So, what are these gems? But first, as this article is for Brit Grit Alley I’ll apply a filter – the authors must be British (and I’ll include Southern Ireland here too, not to say the country is part of Britain, just to widen the net), gritty and indie or self-published. These days it seems that many of the best crime writers hail from Scotland. The three big industries there are oil, whisky (malt of course) and crime writing. The latter two are relatively easily obtainable and go together very well (in my humble opinion). There are of course the obvious big hitters – Ian Rankin and the sadly recently departed Iain (M) Banks, but in recent years a flurry of really high quality authors have emerged. I hadn’t realised quite how many until I read Tony Black’s Hard Truths. This is a fascinating collection of interviews with authors about the mechanics of writing. Which leads us to Tony Black himself, who absolutely falls into the great and gritty category. In fact Tony has moved away from mainstream (he has a contract with Random House UK) to independent publishing (Blasted Heath – another great Scottish institution). He has recently released a plethora of work, and I haven’t come across a bad piece yet. In fact all are excellent. I particularly enjoyed his Gus Dury series, which concerns an ex-reporter with a seriously large self-destruct button. Two guys making recent entrances are Mark Wilson, who is now an independent publisher as well as a writer (Naebody’s Hero and hard-hitting Head Boy) and David Ross’ The Last Days of Disco, an excellent debut. There are also many I’ve yet to read on my Kindle such as Ray Banks, Allan Guthrie and Michael J. Malone to name but a few. Heading over the water an author I admire greatly is Gerard Brennan (another from the Blasted Heath stable). The first of his stories I read was Fireproof, a tale about Mike Rocks who’s dead but is sent back by the Devil to found a church in his name. Sounds madcap? It is, but very funny. Gerard is particularly adept at the novella, The Point is another excellent read, but you wouldn’t be disappointed with any of his stories. Declan Burke is an award winning author and only a recent discovery (for me) via Slaughter’s Hound and The Big O. Both are great books by a very talented writer. The Stanton Brothers are tough bastards, a sort of modern day Robin Hood / Little John duo – but they keep the money for themselves. Martin Stanley is the author and he has a tranche of novels and novellas worth reading. Charlie Williams’ Mangel Series are also excellent. Royston Blake, who narrates the stories, is one of the most unusual lead characters you’ll ever come across. He also swears a lot. Tales of the Longcroft Estate are a collection of short stories by Darren Sant. They’re based on his childhood home, and he doesn’t pull any punches. Ryan Bracha produces work that pushes the boundaries. His debut, with the excellent title Strangers Are Just Friends You Haven’t Killed Yet, is a multi-perspective novel that’s unlike anything else I’ve ever read. Don’t read any of Ryan’s work if you’re easily offended. If you like your crime to be cerebral then pick up Richard Godwin. I recently reviewed his latest release One Lost Summer. Cleverly constructed, it’ll keep you guessing to the end. Master of flash-fiction and the short story is Paul D. Brazill. Languid is probably the phrase best applied to Paul’s writing. Incredibly descriptive his prose rolls off the tongue. Ian Ayris is an author capable of making grown men cry. His novella A Day in the Life of Jason Dean is one of the finest pieces of writing I’ve ever come across. Brilliant, clever and gut wrenching. His full length novel, Abide With Me is also a superb tale about a group of boys growing up. Nick Quantrill’s protagonist is private investigator Joe Geraghty, based in Hull. Nick is about to publish his third novel Broken Dreams. His stories are slow burn, intelligent and multi-faceted. Last, but not least, is HJ Hampson (more Blasted Heath!) whose debut novel, The Vanity Game, is a very apt story about a footballer who ends up in the worst of situations. Keith Nixon’s The Fix is published by Caffeine Nights and you can find it here. Paul D. Brazill is the author of Gumshoe, Guns Of Brixton and Roman Dalton - Werewolf PI. He was born in England and lives in Poland. He is an International Thriller Writers Inc member whose writing has been translated into Italian, Polish and Slovene. 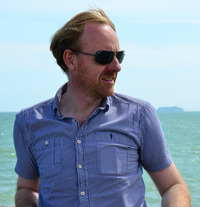 He has had writing published in various magazines and anthologies, including The Mammoth Books of Best British Crime 8 and 10, alongside the likes of Ian Rankin, Neil Gaiman and Lee Child. He has edited a few anthologies, including the best-selling True Brit Grit – with Luca Veste. HE BLOGS HERE.